Offer your near and dear a festive gift that tastes as good as it looks! With these Christmas cookies decorated with Sweet Isabelle's marshmallow fondant, it's magic, fun and wonder guaranteed! These unique and original creations will light up whoever you give them to like Rudolph's nose! Perfect as a hostess or corporate gift. 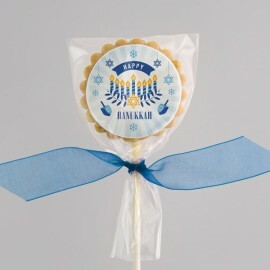 Option available to personalize cookies intended as corporate gifts. Christmas Cookie Collection - Original Gift Idea There are 15 products. These delicious shortbread cookies (Medium size) on stick, decorated with marshmallow fondant Christmas shapes are the perfect gift to every real gourmet. Make a nice decoration on your wrapped gift, on your Christmas table or stocking. 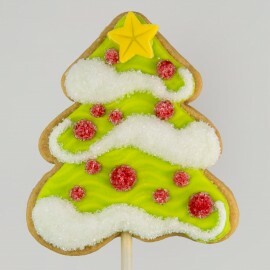 These large delicious shortbread cookies on stick, decorated with marshmallow fondant Christmas shapes are the perfect gift to every real gourmet. Make a nice decoration on your wrapped gift, on your Christmas table or stocking. 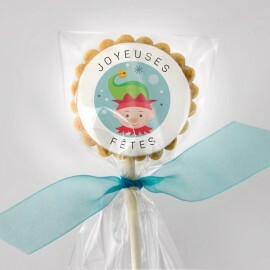 These delicious shortbread cookies on stick, decorated with homemade fondant are the perfect gift to every real gourmet. Make a nice decoration on your wrapped gift, on your dessert table or stocking. 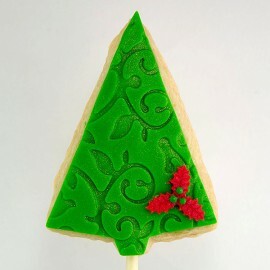 Christmas Tree shortbread on a stick decorated with our delicious marshmallow fondant. Just as tasty as they look, these gourmet Christmas cookies will certainly bring magic, fun and wonder to your Christmas stocking!Wrapped in food grade cello and organza ribbon.Note: decoration may vary slightly. Santa's Reindeer shortbread on a stick decorated with our delicious marshmallow fondant. Just as tasty as they look, these gourmet Christmas cookies will certainly bring magic, fun and wonder to your Christmas stocking!Wrapped in food grade cello and organza ribbon.Note: decoration may vary slightly. 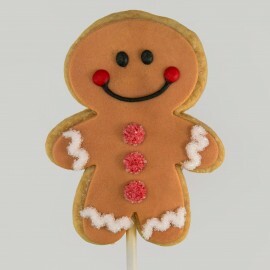 Christmas Gingerbread Man shortbread on a stick decorated with our delicious marshmallow fondant. Just as tasty as they look, these gourmet Christmas cookies will certainly bring magic, fun and wonder to your Christmas stocking!Wrapped in food grade cello and organza ribbon.Note: decoration may vary slightly. 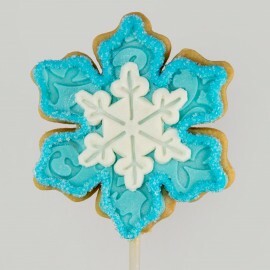 Christmas snowflake shortbread on a stick decorated with our delicious marshmallow fondant, an exclusive house recipe. 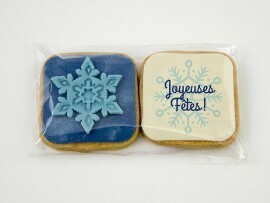 Just as tasty as they look, these chic Christmas cookies, will sure put magic, fun and wonder in your Christmas stocking! Wrapped in food grade cello and organza ribbon. Note: decoration may vary slightly. 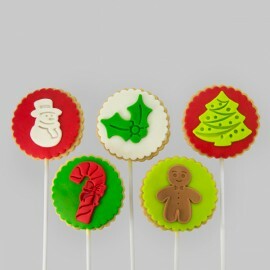 Santa's playful elf shortbread on a stick decorated with our delicious marshmallow fondant. Just as tasty as they look, these gourmet Christmas cookies will certainly bring magic, fun and wonder to your Christmas stocking!Wrapped in food grade cello and organza ribbon.Note: decoration may vary slightly. 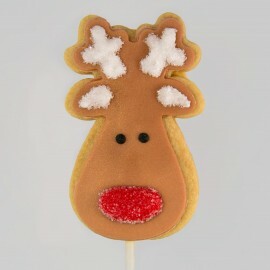 Big Reindeer shortbread on a stick decorated with our delicious marshmallow fondant. Just as tasty as they look, these gourmet Christmas cookies will certainly bring magic, fun and wonder to your Christmas stocking!Wrapped in food grade cello and organza ribbon.Note: decoration may vary slightly. 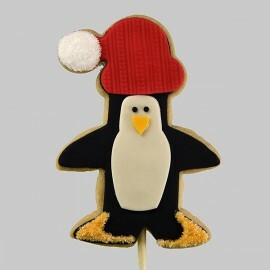 Penguin Christmas shortbread on a stick decorated with our delicious marshmallow fondant. Just as tasty as they look, these gourmet Christmas cookies will certainly bring magic, fun and wonder to your Christmas stocking!Wrapped in food grade cello and organza ribbon.Note: decoration may vary slightly. 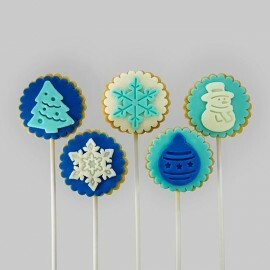 Snowy Christmas tree shortbread on a stick decorated with our delicious marshmallow fondant. Just as tasty as they look, these gourmet Christmas cookies will certainly bring magic, fun and wonder to your Christmas stocking!Wrapped in food grade cello and organza ribbon.Note: decoration may vary slightly. 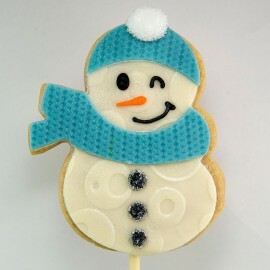 Christmas Snowman shortbread on a stick decorated with our delicious marshmallow fondant. Just as tasty as they look, these gourmet Christmas cookies will certainly bring magic, fun and wonder to your Christmas stocking!Wrapped in food grade cello and organza ribbon.Note: decoration may vary slightly.